"Beyond the American Dream" – Millard's first book available for the first time! Millard and Linda Fuller built Habitat for Humanity International and The Fuller Center for Housing from the ground up. Their story is an inspiration to millions and continues to impact the lives of people around the world today. However, their story hasn’t been told in its entirety. An autobiography written by Millard Fuller in 1968, and being published for the first time in September, will fill in the earliest part of the story. This compelling narrative chronicles Millard’s childhood, how he became a self-made millionaire at age 29 and then gave up his fortune to save his marriage and seek a new mission in life. Now for the first time, the story of Millard’s life from Alabama country boy to millionaire is told by Millard himself. The book was never published before Millard’s death in early 2009. But this year Linda rediscovered the manuscript in the back of a filing cabinet, the pages now 40 years old. “A few weeks following Millard’s sudden and unexpected death, typing the manuscript on my computer helped heal some of the intense grief I was feeling. In a number of instances, I was moved to tears realizing that here, in its totality, was the story of Millard – boy, youth and man – in his early development into the extraordinary human being he became,” Linda said. “Whether one knew him well or not, I believe everyone will find ‘Beyond the American Dream’ a unique and powerful testimony to God taking root in one of His children’s lives for the good of mankind." A millionaire at twenty-nine years of age, Millard Fuller was chasing a rabbit that most of us love to chase. He caught it, realized it wasn’t real, and chose to give himself to what is real. He actually believed that if he sought God’s kingdom and his righteousness first, then other things would take care of themselves! Beyond the American Dream completes the amazing Spiritual Autobiography of Millard Fuller.This story is a blueprint for finding spiritual peace in a modern day world consumed by the chaos of money and success. Through Millard’s words, we learn to slow down, be still and to listen for the voice of God. I call on you to read, mark and use this story as a beacon for your spiritual growth. Friend, as you read this book, you will walk with Milliard in the beginning years of his extraordinary journey through "this vale of soul-making" and I promise you this: You will laugh out loud at Milliard and of course at yourself. You will cry real tears with Milliard and Linda and for yourself. And you will soar after tasting Eternity in the here and now far beyond the American dream with a brand new self. Throughout his lifetime, Millard published 10 books. (The other books are available to order here.) "Beyond the American Dream" is the only known book to be left unpublished. Millard’s “first and last” book was released Sept. 9 at the Fuller Center’s annual build in Indianapolis that honors its founder, the Millard Fuller Legacy Build. Click here to order the book, "Beyond the American Dream". As with all of Millard’s books, all proceeds go to The Fuller Center for Housing. 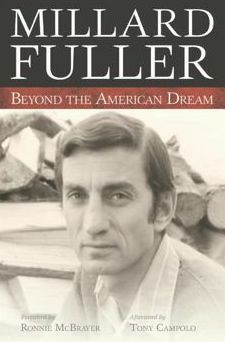 Sign up to receive our monthly e-news alerts for updates on "Beyond the American Dream" and other Fuller Center happenings.